Day 4 saw us on the subway and heading for the Guggenheim Museum. Designed by Frank Lloyd Wright the building is cylindrical, wider at the top than the bottom. Its unique ramp gallery extends up from ground level in a long, continuous spiral along the outer edges of the building to end just under the ceiling skylight. It is the permanent home of a continuously expanding collection of Impressionist, Post-Impressionist, early Modern and contemporary art. Important works include those by Paul Gauguin, Edouard Manet, Camille Pissarro, Vincent van Gogh and 32 works by Pablo Picasso. The co driver was particularly interested in the Kandinsky collection. I think I liked the building more than the art. For lunch we headed back to midtown to the 2nd Ave Deli which is now on 33rd St. Most tourists head for Katz's Deli (think the "I'll have what she's having" scene from When Harry Met Sally) for their Jewish deli experience so I was looking for something a little quieter. This alternative was a perfect choice filled with business people and family groups. The food was excellent and the service friendly and devoid of any 'tude prevalent in the other place. 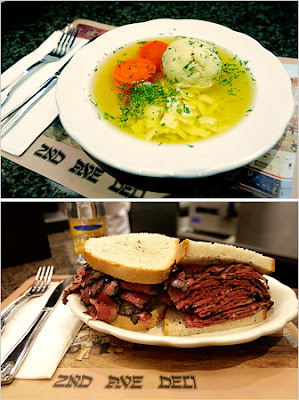 I had Matzoh Ball Soup with Carrots and Noodles and half a hot pastrami sandwich with cole slaw, pickle and Russian dressing and a HUGE serving of fries on the side. The co driver had a traditional hot dog with sauerkraut and mustard and shared my fries. It don't get much better than that! Walking back to the station was the only glimpse we had of the Empire State building. And this time around we managed totally to avoid Times Square. Next stop was the Strand Book Store with its huge collection of new and used books. As of July 2016, the store claims to have 2.5 million volumes. The New York Times called The Strand "the undisputed king of the city’s independent bookstores." The co driver was after some out of print quilting books and found one of the two. The day had really heated up and we were quickly running out of steam so we abandoned our program eg. revisit the High Line, and headed back to the hotel in preparation for our farewell dinner with 'the kids'. 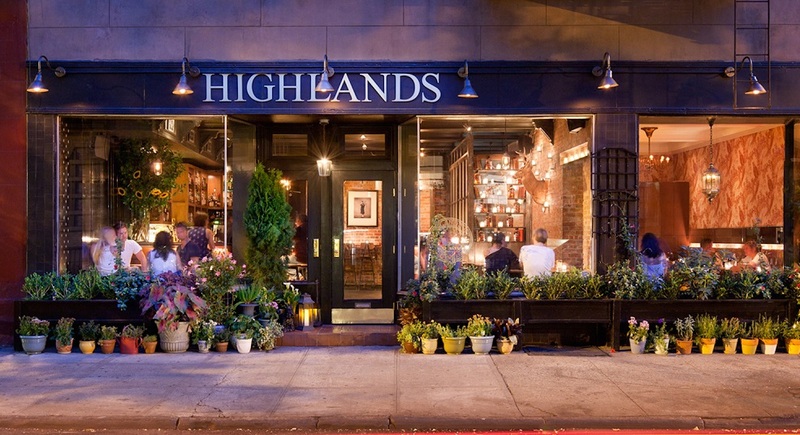 The selected venue was the Highlands Restaurant in Greenwich Village mainly because they serve haggis. Nick and the daughter shared Scotch eggs as starters and the co driver and I shared smoked haddock and blue crab cakes with market greens, blood orange and citrus-chilli aioli. The haggis, neeps and tatties were terrific and I couldn't resist the sticky toffee pudding with vanilla ice cream for dessert. This was all washed down with a good bottle of Sancerre, Domaine Martin, Chavignol, France, 2016. Roll us all outta there! So our time in the city that never sleeps was up. It was good to see where Nick and the daughter were living and to know they were happy in their jobs and new environment. I don't think they will be heading home any time soon. And they really went out of their way to show us around with plenty of places off the usual tourist route. Next stop for us.....South Dakota.